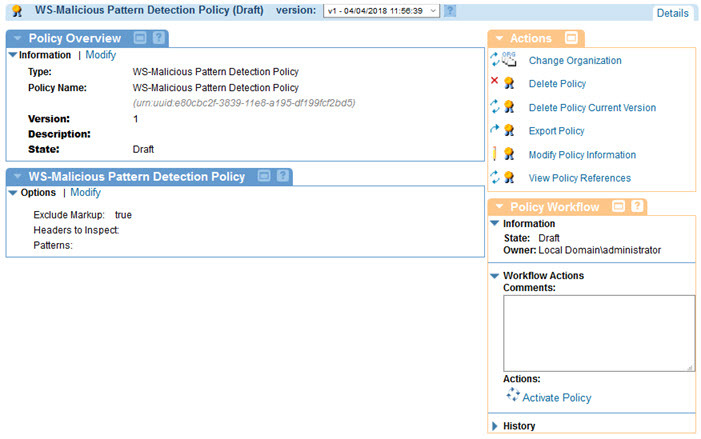 Learn about the WS-Malicious Pattern Detection Policy and policy configuration options. The WS-Malicious Pattern Detection policy is very similar to the HTTP Malicious Pattern Detection policy, but it is tailored for SOAP messages. In particular, the SOAP body and SOAP headers can be handled differently. You can use the WS-Malicious Pattern Detection policy for SOAP message (transmitted over HTTP), but the envelope has no special meaning and would be treated as any XML content. 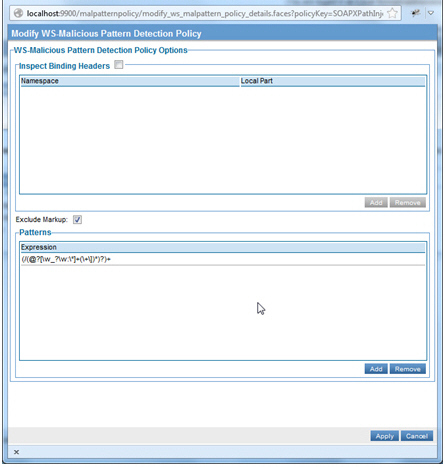 The Modify WS-Malicious Pattern Detection Policy screen allows you to modify the required content options for the WS-Malicious Pattern Detection policy. 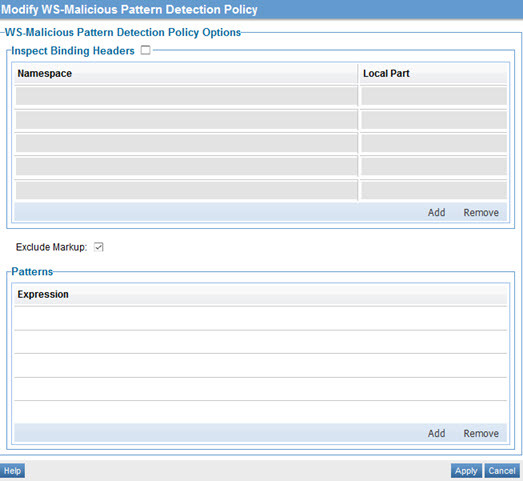 In the second panel, click Modify to access the Modify WS-Malicious Pattern Detection Policy page, as shown below. Specify values. For information about the fields, refer to WS-Malicious Pattern Detection policy options below. The Modify WS-Malicious Pattern Detection Policy wizard has only one page. It includes the options listed below. Optionally, SOAP headers can be scanned for patterns. By default, if you select this option, all headers will be scanned. To scan only certain headers, add the header names in the table. If markup is excluded only the content of the properties, not the markup itself, will be scanned. For example, an XML tag will not be scanned, just the tag's value. One or more regular expression patterns to scan for. Any match will cause the message to be rejected. For more information about using regular expressions, see Using Regular Expressions in Policies. The following examples illustrate an out-of-the-box SOAP XPath Injection policy which is an application of the WS-Malicious Pattern Detection policy. In the example below, the regular expression matches XPath symbols. A SOAP SQL detection policy is also included out-of-the-box. Its expressions match SQL symbols and keywords, as shown below.